The vast majority of Canadians in recent polling -- across all provinces and across all political parties -- say there is “solid evidence of global warming”. Solid majorities label it “very serious” and say the federal government has “a great deal of responsibility” for addressing it. Majorities support paying up to $50/month in carbon taxes or cap & trade. So Prime Minister Stephen Harper was right to commit our nation to finally cut our climate pollution by 17 per cent from our 2005 levels. It’s a task that will require all of us, “Team Canada”, to do our equal share to create low-carbon prosperity for all Canadians. 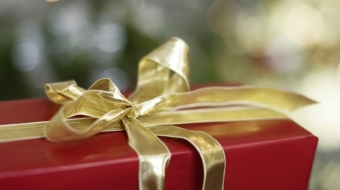 So far, however, one province has failed to act in the spirit of Harper’s pledge: Alberta. By 2020, the rest of the Canadian economy is on track to cut CO2 by 65 Mt. 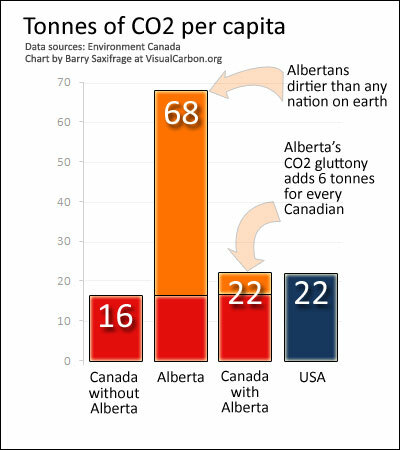 But Alberta’s oil sands alone are on track to increase their CO2 pollution by even more: 78 Mt1. “Oops” again. Is Alberta skating for Team Canada or not? Alberta’s climate pollution has grown so fast that it now takes up a third of Canada’s total allotment. Yet Alberta creates just 14 per cent of our national GDP. 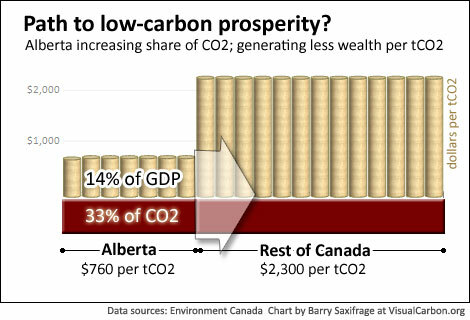 Alberta generates $760 per tonne of CO2 (tCO2) -- three times less -- than the $2,300 the rest of Canada’s economy produces2. Like the oil sands, Alberta’s economy as a whole is grabbing more and more of our nation’s limited CO2 allotment -- without paying for it and while producing far less prosperity per tCO2 appropriated. Per person, Albertans dump 68 tCO2 each year -- more than any nation on earth. Compare that to Quebec (11 tCO2), Ontario (15) and B.C. 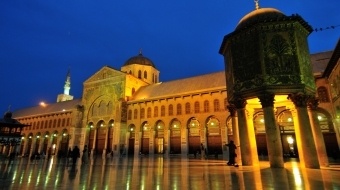 (15), which combined contribute 73 per cent of Canada’s GDP. 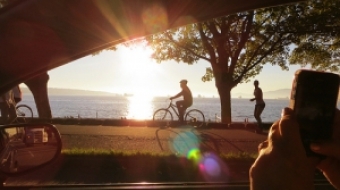 The average for all Canadians outside Alberta is 16 tCO2. When the 52-tonne-overweight Albertans are added in, however, our national average rises to 22 tCO23. Albertans are wealthier than Canadians in any other province. If anyone can afford to clean up their high climate-pollution economy, it is Albertans. And yet they have refused to halt their CO2 growth. They have refused to cut their dirtier-than-any-nation personal climate stomp. They have refused to help the rest of Team Canada make the needed improvements. Instead, they have saddled the rest of Canadians with six extra tonnes of CO2 pollution that the rest of us have to try to extricate ourselves out from under. It is a lot harder to skate well while lugging an extra six tonnes of flab. Since 2005, Alberta’s climate pollution rose two per cent a year, as it has for decades now. Since 1990, over half of Canada’s rise in climate pollution has come from this one province with just 11 per cent of our population. 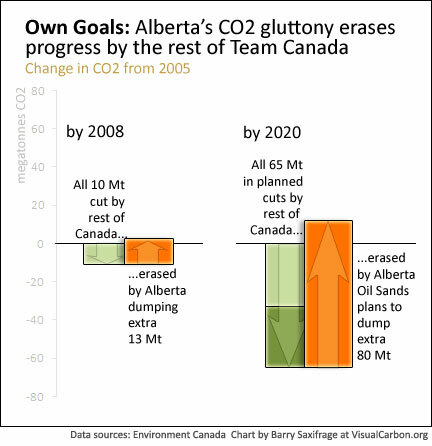 It’s a trend that, unchecked, will have Albertans gobbling half of Canada’s total CO2 allotment within 10 years4. It is like having your worst scoring line hogging ever more of the game’s playing time. For decades, Albertans have refused either to stop their emissions growth or to adopt policies similar to those of their neighbours.